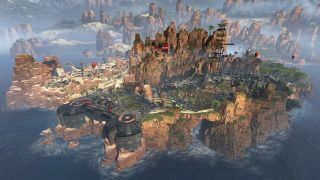 With millions of players dipping into the new mega-hit battle royale Apex Legends and scavenging its Kings Canyon map for loot, it's cool to see that players are still uncovering new secrets which developer Respawn Entertainment snuck in. Two Easter eggs that have been uncovered since last week's surprise launch include a touching tribute to a developer's dog and the appearance of the Nessie plushie that's seen all kinds of sights throughout the Titanfall series. Let's start with the latter, just in case you're not emotionally prepared for a potentially tear-jerking story. As spotted by players and collated on Kotaku, the mini-Loch Ness Monster plushie Nessie has been a mainstay of Respawn's map design. The little lizard can be found tucked away in just about every single-player level and multiplayer map. Many Nessie locations have been documented, and Nessie lives on in Apex, which takes place in the same universe as Titanfall. She's currently nestled away in the training area, though you'll need to do some serious parkour climbing to reach her. Those scouring the training area for Easter eggs have also found a little stuffed dog, which initially just seemed like a cute bit of decoration. But you can find that same dog plushie in a small corner of Kings Canyon's Market area, chilling on a pillow alongside two portraits. As lead level designer Jason McCord explained, this pup is actually a tribute to his dog Shadie, who passed away during the making of Apex Legends. "Our dog of 10 years passed away suddenly from health issues while I was working hard on Kings Canyon," McCord shared on Twitter. "As any animal lover knows, this was a crushing blow to my morale and made many days hard to come to work. Shadie was our best friend, and so I wanted her to live on in this little corner of the map. It legit makes me feel better to visit this area sometimes." Shadie was obviously a very good girl, and it's sweet to see her standing guard in plushie form alongside a picture of McCord and his wife. If you happen to see Shadie during your quest for Champion status, consider giving her a treat from your inventory. It's not like dropping your finest weapon attachment at her paws will actually do anything (that we know of, anyway), but it's in the spirit of honoring all good dogs everywhere. Here's a full version of Shadie's picture so you can appreciate her in all her fluffy glory.